Don’t miss the Southport Wooden Boat Show on Saturday, September 28. I attended last year along with my daughter, son-in-law, eight year old granddaughter and 5,000 other people. It was a wonderful way to spend a lovely Fall day in Southport, NC. There was music in the air (provided by a live band) as well as the smell of seafood chowder from the Seafood Chowder Cook-off . An eclectic display of wooden boats lined the yacht basin and nearby streets. There were nautical crafts for sale like hand hewn wood mermaids, ships in bottles and floor mats and other goods made with nautical ropes. We had the opportunity to watch a wooden boat being built by boat building father and son, John and Sean Holscher. The Southport Maritime Museum provided a pirate boat building kit to kids (complete with the required plank for walking) along with help in building it and an ‘ocean’ in which to float it. The Fort Fisher Aquarium manned a tent with an extensive array of sea shells and docents to name and explain them. The boats at this show will be some of the most beautiful wooden boats you have ever seen as they will be vying for the prizes that are awarded. You will see all kinds of boats from kayaks to sail boats and can vote for your favorite. This year’s seafood chowder cook-off tasting begins at 11 am and lasts until 2 pm so if you love chowder, here is your chance to have a variety of chowders for lunch for a fee of only $5. ‘Out on the Ocean’ will provide music throughout the day. This group is famous for it’s Celtic, Old Time, French Canadian, and Bluegrass music and will keep your feet tapping. Southport Wooden Boat Show 2013 posters and T-Shirts will be available in the Ship’s Store, located in the Old Yacht Basin. You will want to be sure to purchase one of these. Both feature a reproduction of a beautiful nautical painting by local watercolor artist, Roger Tatum, called ‘Catch of the Day’. Have you been thinking about traveling but have been hesitant about doing so? 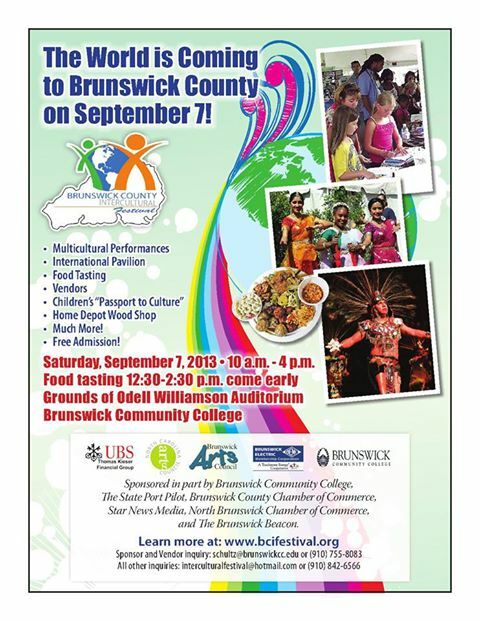 Why not make the short trip to Brunswick Community College in Bolivia, NC on Saturday, September 7, 2013 and take part in the Brunswick County Intercultural Festival for free? The festival runs from 10 AM until 4 PM on the grounds of the Odell Williamson Auditorium. Continuous entertainment begins at 10:30 AM and features storytelling and performances by such groups as: Polynesian Island Dance where you can learn to dance the Hula; Youth Japanese Drummers; the Indian Group from Cape Fear;, Techmoja Dance and Theater Group; and Ballet Folklorico Gudalupano. Kids can receive passports and learn about more than 20 countries from local residents at the International Pavilion and win a prize to boot. They can also witness a painting demonstration by an Union Elementary School student and take part in a PaintAlong. For fee of $8.00 you can participate in a food tasting from 12:30 PM until 2:30 PM where you can sample cuisine from all over the world.